A sculpture by 2014 Master of Fine Arts graduate Meredith Randall Knight, pictured here, was auctioned off at Nucor Steel’s annual fundraiser for Children’s of Alabama and raised $6,000 for the hospital. From the December 2014 edition of Desktop News | Three students and a professor in the Department of Art and Art History recently designed and created sculptures that were auctioned off by Nucor Steel to raise money for Children’s of Alabama, a pediatric hospital located in Birmingham. Together, the sculptures raised $46,000 for the hospital. This was the eighth year that Nucor Steel has hosted the Children’s Charity Classic, an annual golf tournament and auction raising money for the hospital, but the first year that University of Alabama students and faculty were asked to participate. Associate Professor Craig Wedderspoon was asked by the event’s planning committee, made up of Nucor executives and Children’s Board members, to find students to create and donate sculptures made of Nucor steel for the event. Wedderspoon, 2014 Master of Fine Arts graduate Meredith Randall Knight, graduate student Kelly Shannon, and senior Bachelor of Fine Arts student Eric Nubbe each presented sculpture proposals to the committee, and to Wedderspoon and the student’s surprise, the committee chose all four projects for auction. 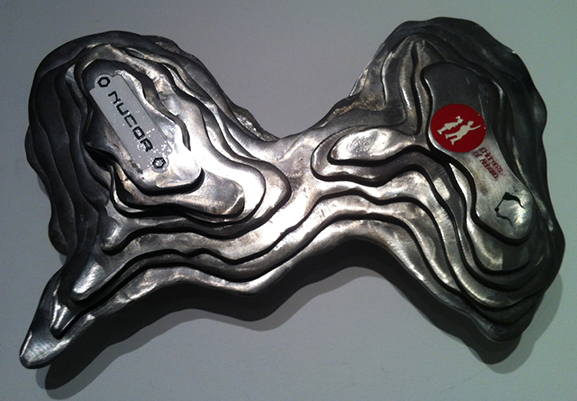 Knight used steel to make a small topographical landform mimicking a section of the golf course. She placed the Nucor logo where golfers would tee off and added a hole at the opposite end of the piece with the Children’s of Alabama logo as the “goal,” emphasizing the charity’s purpose. Knight’s sculpture raised $6,000 at the event. Shannon created a hollow golf ball with elements of the Nucor logo incorporated on the outside, the Children’s of Alabama logo inside and light filtering outward through holes in the outer layer. Shannon’s sculpture raised $9,000. Nubbe took a different approach and made a small replica of Children’s of Alabama itself, with the Nucor logo on one side and the Children’s of Alabama logo and the name of the event on the other. His sculpture raised $11,000. Wedderspoon made a bronze statue of “Simon the Lion,” a stuffed lion given to every Children’s of Alabama patient when he or she checks in to the hospital. Wedderspoon’s sculpture raised $20,000. Wedderspoon said the event was valuable in giving his students connections to potential clients, but also by giving them the opportunity to do something for someone else. “I always try to emphasize with my students that everything is not about them, and this was a great way for them to use their work to help other people,” he said.